I find it difficult to articulate quite what I need to say. Or maybe what I want to say. I’m talking in terms of being a human, not as a theatre-maker. In July I had the pleasure of spending two weeks at Theatre Deli’s Old Library to develop my new show Slap Back Echo. The piece is inspired by a personal explosion. It is about suppression, expression, finding the words, losing them, finding them again, not necessarily using them, saving them for the right moment, not knowing when that moment is, waiting, holding, waiting again, then realising that moment is now or that maybe it’s gone. It’s about being able to say how you feel. And the consequence of holding things in. Working closely with composer Rosa Brook we used our time in the Old Library to translate personal, internal feelings into external movements, sounds, images and moments. The week before we had been at the Young Vic where a structure had been built and established and now we needed to fill it. 1. What is stopping you from doing what you want? 2. How can you find chaos when you’re fully in control? 3. How much do you need to tell? Having these questions allowed for a friction. It felt very much like we were kneading dough. We were able to pull ideas apart, seeing how far they stretched before breaking. Not only did these questions relate to the content of the show but also the process behind it. It was a really good way to recognise restrictions, to celebrate them, to find ways out of them and see what happened if we stayed in them. Our time at The Old Library was an enriching experience used to generate lots of material. We left with a real sense purpose and what we needed in order to drive the piece forward into the next phase of development. Slap Back Echo has been developed with The Tank NYC, Young Vic, Theatre Deli and ARC Stockton. It will be touring Spring next year. Recently MA student Becky Williams interviewed me about the process of creating How to Drown a Fish, my first solo show. Perfectly timed, after my weeks in Edinburgh, it was a great moment to reflect on what has been a long, challenging and rewarding process. Becky: How would you describe the process of creating How to Drown a Fish? Grace: How to Drown a Fish was a challenge that I set myself. Although I had directed solo work, I had never been the sole artist before. It was an experiment brought about by the situation I found myself in. At the time those who I had previously collaborated with had either gone back to their homes in other countries or were in further education. This was an opportunity to see what the colour of the work was that I created by myself. Becky: Did you work alone or did you work with others and if so how? Grace: For some reason I thought that being a solo artist meant that you had to work by yourself. It doesn’t. You can define the terms, there are no rules or specific ways to create solo work, its not cheating or a weakness if you ask others for help. I started the process working alone. Inspired by research and using memories, I would set myself tasks. I would then follow these tasks out, recording everything that I did, then at the end of the day I would watch it back. When watching the material I would often analyse it as if I was watching an actor. Instead of saying “I need to do this” I would say “she needs to do that”, which was a method I used to try and distance myself from the material. It was a separation of the self into three parts: the facilitator, the performer and the director. While I was working independently at the beginning of the process, I was lucky enough to be a part of Camden People’s Theatre’s Artist Development programme, Starting Blocks. The three-month programme involved weekly meetings with Artistic Director Brian Logan and five other artists who were also working on shows from scratch. Here you could voice problems and receive invaluable feedback from people who were outside of your work. This was crucial. I later discovered that my process did thrive on collaboration and I needed people to bounce off of. In my second round of R&D for the show I invited collaborators into the process for a week of playing. I invited artists with different skill sets to my own: a composer, a writer, a photographer and a lighting designer. I had been attached to the work for quite some time so this week, which was crucial to the piece, allowed me to look at the work through different lenses, and thoroughly investigate the choices I had made. Becky: What were the major challenges you faced throughout the process? How did you over come these? Grace: As previously mentioned, in the early stages of creating I would work independently. I found that, because I was working by myself, once I found something that I liked I would keep repeating it, avoiding the questions that I didn’t have the answers to. I also found that I started working in a linear manner, trying to work out what came next, rather than being playful and open to the unknown. When I found that I was stuck in a pattern I would try to break it. For example, when I realised that being in the studio was hindering more than helping I decided to try and find inspiration in another ways. Because the piece is a lot to do with drowning, I left the studio and had "water day”. This involved me going around London, visiting the Italian water gardens and Serpentine Lake in Hyde Park, getting a boat from Tate Britain to Tate modern and visiting the London Aquarium. To do something that indirectly linked to the show really helped to refresh my approach to creating. I also found that I was incredibly harsh on myself and would say no to my own ideas before I had even tried them. In the past, when creating work with collaborators, I would freely share thoughts. However when I invited Zach (dramaturg) or Flora ( writer and collaborator) into rehearsals I realised that I had become very internal and that I had started to censor myself. Often they would have to ask what I was thinking and forced me me to express and try out ideas, in order to stop me from cutting myself off. Becky: What advice would you give anyone who is going to develop a solo show in the future? Grace: Don’t be afraid to ask for help. Whether that is just having someone to talk about the challenges you are facing outside of the studio, a collaborator in the room or someone to help you carry your props to the theatre. If you are creating a solo show make sure you are spending time with other human beings. It can become all-consuming. If you are working with collaborators make sure you set up the parameters of that relationship. What do you expect of them? Is this measured in hours or in tasks? Also ensure that you pay and credit people accordingly for the work that they do. If you cant pay them try to provide something, whether that is croissant or a small fee for lunch. Really interrogate why you are creating a solo show. Does the form match the content? Can it only be you on stage telling the story and if so why? Also just because you are making a solo show doesn’t necessarily mean that you have to keep doing it and doesn’t mean that you are a solo artist. At times I feel that I have created a box for myself and that’s what I fit into, however it's about what the content of your material requires. Maybe it makes sense for this show to be a solo but it doesn’t mean that next one will be. Allow yourself that possibility. Interview by Becky Williams, Aug, 2017. This month I'm back in China again facilitating workshops and directing a play with teenagers. As a theatre-maker I love working in real time, allowing things to take as long as they need to take on stage, highlighting imperfections and reminding audiences that performers are human beings too. However when working with nonprofessionals, who will be performing in front of an audience, who are expecting a show that aims to reach a “professional" standard, how can these imperfect moments be framed and understood as intentional? During the first full run-through of any piece mistakes are bound to happen, and during our run yesterday there were some genius comedic moments that came about through things going wrong. One cast member spent three minutes working out how to open a mechanical curtain, lines were said at the wrong time changing the whole tone of a scene and on multiple occasions people realised that they were on wrong side of the stage and tried to get around to the other side without the audience noticing. Absolutely incredible moments that, in a different situation I would include in a heartbeat. But working in this context these mistakes if kept in would potentially make the play seem unfinished and lazy, which in this instance could be seen as a negative thing. Thinking about performers whose work involved well-crafted mistakes such as Buster Keaton or Lucile Ball, there is an understanding that the accidents are intended. Although still surprising, the calamities are executed with such precision that the audience realises that they are deliberate. Additionally Buster Keaton physically presented himself as a clown, and therefore people expected failure or the negotiation to avoid failure to be present in his work. But with a nonprofressional cast, or maybe not with all nonprofessional casts but with this group of teenagers in this situation, it is different. Much like my research into children’s dance competitions for How to Drown a Fish, there is awareness that we are watching children perform and therefore there isn’t a need to highlight that they are “human” because we are aware of the context. Those qualities come through without having to be a skill or presented as it. With the audience there is a forgiveness (most of the time) for mistakes and a potential understanding that things may go wrong but it is different to say watching Buster Keaton. Maybe this is in fact patronising of me to say. But I think its potentially do to with control, intension and expectation. In order for mistakes, in the context of the show that I’m creating in Shenzhen, to work they would need to seem intentional which takes away from original reason why they were entertaining. Oh its a lot to think about! I’m currently in the process of redeveloping How to Drown a Fish (details to follow) and all of this is fascinating but has also slightly blown my mind. If anyone has any thoughts I would love to hear them. Back to rehearsals in 28 degree heat. Here’s a picture of a beautiful pair of bins. We knew we wanted to work together again. Circumstance and individual curiosities took us in different directions and although we were living in different countries now felt like the right time to come together and collaborate. Creating material within our friendship came very naturally to us, but when we decided to put ourselves back in a rehearsal studio it was clear that we both had changed and our practices had developed and altered. The last time we worked together was in 2012, so unsurprisingly (yet incredibly surprisingly to us) when we got back in the studio we found it more challenging than we expected. The start of a devising process is wonderful but difficult, the piece could be anything, and it could go anywhere. In the beginning of our R&D in Paris, Harry and I put a lot of pressure on ourselves to create material, to slot straight back into it as if nothing had changed, rather than understanding our new practice and what it meant to work together. Although we were excited about collaborating and acknowledged our differences, there was an expectancy that we would immediately speak the same language despite having both done further training at two very different institutes (Harry went to Lecoq and I went to Central School of Speech and Drama). 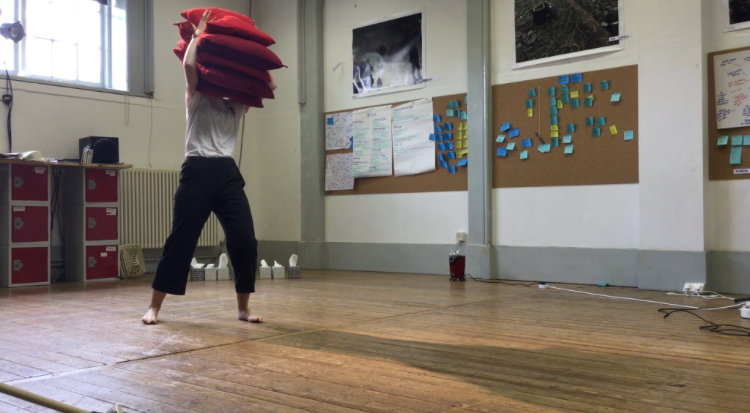 For me our first week of R&D, felt like a waste of time (for Harry it was it was more a feeling of frustration/disappointment) and that the collaboration was “failing” as it wasn’t the same as before. We left the week with little direction, however we were determined to push through as we had another R&D at Camden People’s Theatre. So we decided to approach the next week of R&D differently. We had the realisation (thanks to friend Jennifer Jackson) that we should see the process as a chance to share skills. To give an insight into the most beneficial things we learnt from our time apart. This really opened up our practice, gaining a deeper understanding of each other’s brains and meant that we were starting to sing from the same hymn sheet. Looking back now and discussing it with H.K the muddy time that we had was necessary in order for us to get to where we are now. Even though as friends we know each other very well and share a love for bizarre stories of human beings and making up elaborate dance routines it is important not to assume anything when going into a process. Although we are still developing our practice, we can now start to really wrestle with the show we want to make. Exploring walls, boundaries and personal space, after our showing at CPT we have found momentum again. Instead of being about context this post is about content. I was invited to perform at a wonderfully curated night called "Piñata" . As a theatre-maker I have never been part of a line up so I was hesitant to take the opportunity, but they reassured me that it was a supportive environment with a curious audience. So I thought that if I was going to be out of my comfort zone I should really be as far out of it as physically possible: I decided to perform in a way that I hadn't done before. It wasn't a groundbreaking new style that would leave audiences dribbling, but it felt personally quite radical. I sat on a chair and told a personal story about a nosebleed I had. I'm currently in the very early stages of developing a new solo show. I have a story that I want to blow up and explore all the possible shards that it is made of. By performing the stimulus in its rawest form, I hoped to see if it is in fact of interest to anyone other than myself and worth exploring further. Good news is that it is! There was something so comfortable about telling a story in the moment without having to learn lines. It felt natural and authentic. Afterwards however, when I was in the bar, I became extremely self-conscious and felt that I couldn’t look at anyone in the eye. I felt like a plumped up cushion, unsettled. It wasn’t a cathartic experience as nothing was released or let go. I had revealed a story with very personal details to a group of strangers, presented it as Art and it didn’t quite sit right in my bones. I started to think about what it means to “suffer for your art”. On one side, that phrase can mean using difficult experiences or trauma to create work but, and in this instance, it may refer to the difficulty or consequences of sharing something personal, and what that can cost you emotionally. Creator of Happenings, Allan Kaprow, suggested “The line between art and life should be kept as fluid, and perhaps as indistinct as possible” (taken from Heddon’s Autobiography and Performance 2008) , and although I do agree with this to some extent maybe its about understanding how you filter your work and yourself on stage. Since then I have thought a lot about what methods can be utilised to protect myself as a performer when working with auto-biographical material, and the form that auto-biographical material can take. The new show that I am developing is to do with delayed reactions and losing control over your body so the question is how do I remain in control of the piece that is to do with losing it? What does it look and feel like to be in and out of control and how will that develop the form of the piece? What I realised through performing at Piñata was that as a solo artist it is important to push yourself out of your comfort zones. It can often be easy to stay with the familiar and run with a set routine when you are the one driving the work, so it is important to keep surprising yourself even if the idea of it makes you feel uncomfortable. Last month I was invited to direct a play with teenagers in Tianjin, China. While I have been back now for three weeks, questions that arose whilst living there are still very present in my mind. Importantly it has made me reconsider my practice and liberated me from past constraints that I had previously put on myself as an artist. Elderly ladies blasting hip hop versions of Old Macdonald from their Zimmer frames, groups of men in local squares taking their pet birds out for walks, restaurants with gigantic golden mirror balled cows in the entrances, whole families wearing matching outfits, cucumbers grown to look like gods, the sound of spitting in the streets, a Tibetan monk taking a photo for you, Mao souvenir shops, bags with their own haircuts, Mcdonald's Happy Meal toy exhibitions, karaoke bars that seem more like hotels, babies with slits in their trousers so they can excrete directly onto the street, drinking your bottled water to prove to the security guard that it is not poisonous, ordering a toastie and getting an egg. I found that what I knew as the “everyday” was completely flipped on its head; and that was incredibly exciting. After experiencing a different version of reality, where things that I could have never have made up occurred, I have realised that I should censor my work less and put more of what is in my brain on stage as somewhere in the world, it may actually exist. At what point do we stop being an onlooker and become a part of the landscape? What makes a person a part of the landscape? What does this even mean? When does our role shift from viewer to do-er? Is it at a point when things are repeated so often that we stop viewing them as interesting? Is it about being complicit? These questions are extremely interesting to me when applied to the creation of theatre, whether examining the relationship between characters within a play or the way in which an audience engages with the work. Living in China has fuelled my desire to further explore what it means to be mundane, how it comes into fruition and how we then engage with it. Im quite excited to see where my trip will lead me creatively and how it will feed into my work. Please do take your shoes off and make yourself at home. So we get off on the right foot I wanted to let you know what this part of the website is for. You’ll find information about me and my work on other pages, but this space will act as a creative journal. Here I’ll share thoughts, discoveries and questions that have arisen from my process and talk about current inspirations. I’ll be giving an insight into where I’m at as an artist and where I am going. Feel free to take your time and thanks very much for having a look around.